ORCHARD PARK, N.Y. - Buffalo Bills safety Aaron Williams isn't backing away from his criticism of NFL officials, and doesn't care if it costs him. "I don't care if I do get fined," Williams told The Associated Press on Monday. "I speak the way I feel, and that's the way I feel." Williams took issue with a fist bump between two officials after Denver running back C.J. 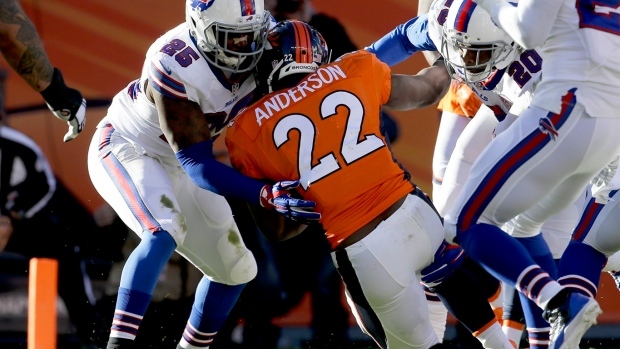 Anderson scored his second of three touchdowns in the Broncos 24-17 win on Sunday. After the game, Williams expressed his displeasure on Twitter, by accusing the officials of teaming up with the Broncos. Williams linked a video of the fist bump and wrote: "No excuse for my performance but we can't win playing 16 vs 11 thought I seen it all Smh (shake my head)." Williams was referring to the number of on-field officials, though there are actually seven and not five at NFL games. The league had no problem with the gesture, which came after line judge John Hussey and umpire Carl Paganelli consulted to determine whether Anderson had crossed the goal line before his knee was down. "It was an acknowledgement of good mechanics between the two officials involved in making the call," NFL spokesman Michael Signora said. The loss was a costly one for the Bills (7-6), who fell to the fringes of a jumbled AFC playoff picture. As a result of tie-breaking formulas, Buffalo ranks 11th in the standings with three games left. The Bills host Green Bay on Sunday. Coach Doug Marrone has seen the video of the fist bump and is aware of the NFL's explanation of what happened. He declined to provide his opinion by saying that's something he will address with the league. What bothered Marrone is how his and the players' frustrations spilled over during the game. Marrone was unhappy with several calls. And defensive end Jerry Hughes was penalized for unsportsmanlike conduct for arguing with an official over a pass-interference penalty against teammate Stephon Gilmore in the second quarter. "It starts with me," Marrone said. "We can't have that in order to win games. What's done is done, and whatever it may be, you need to move on and keep your focus. I've got to do a better job of that. That's my responsibility." Hughes was benched by defensive line coach Pepper Johnson for much of the final 2 1/2 quarters. Marrone said he was not aware of Hughes' benching until after the game. Williams wasn't the only Bills player to complain about the officiating or the fist bump. Cornerback Corey Graham, on Monday, took a more diplomatic approach by saying the officials' celebration wasn't a "good look," but he understood what prompted it. "I saw it. I don't think it was nothing crazy as far as 'Happy that they scored a touchdown,'" Graham said. "It was more of probably just, 'We got that one right.'" Cornerback Nickell Robey was penalized for illegal contact after quarterback Peyton Manning missed a pass to Wes Welker in the end zone on third and 6 at the Bills 19. Replays were inconclusive as to whether Robey interfered with Welker during his route. Two plays later, the Broncos opened the scoring on Anderson's 6-yard run. Following the game, Robey took exception in a note posted on his Twitter account. He wrote: "If u don't like physicality go ref a basketball or tennis game. I don't care (hashtag)nfl (hashtag)refs." Robey didn't make himself available to reporters on Monday. AP National Writer Eddie Pells, in Denver, contributed to this story.